Sarangan is a hill station favored by the Dutch in colonial days. It is half way between Madiun and Solo. The village straddles the southern slope of Mount Lawu, an inactive volcano. At an altitude of 1,287 meters evenings are chilly. 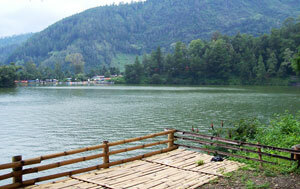 Sarangan Lake that also called Pasir Lake is stay at mount Lawu foot; it’s about 16km (west side) from Magetan city. The tourists can enjoy the nature scenery. The wide of Sarangan Lake is 30 Ha with its depth 28 meters, and its cold air with temperature 18-25 C. There are various facilities in this area, such as; hotel, restaurants, paddle canoe, play ground and horses, which has supplied for the tourists from various region and even foreign tourist.